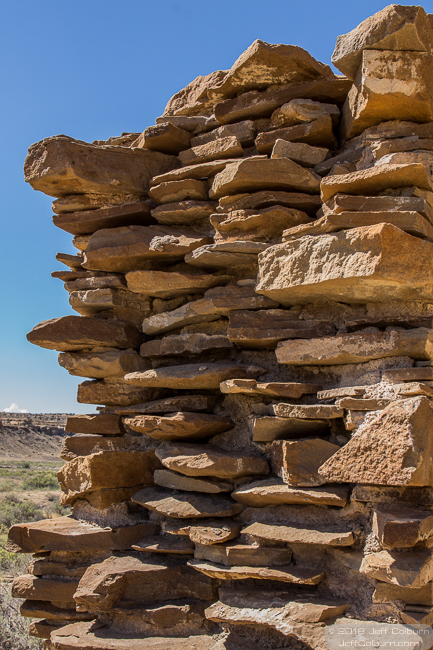 This rock wall is part of the Hungo Pavi Pueblo at Chaco Canyon, New Mexico. It’s about 3 feet (.9 meters) thick. Part of the building has collapsed, revealing the inner structure of the wall. As I mentioned yesterday with my photo of a wall at Chetro Ketl Pueblo, the amount of rock they had to gather is amazing. They didn’t make walls that were rock shells filled with dirt or rubble. Their walls were rock, through and through. It takes a lot of dedication and determination to build structures like this.